Casa Puerta de Esperanza, or “door of hope,” helps women and children deported from the U.S. or seeking asylum. Camila had reached her breaking point. After experiencing domestic violence for years in Columbia, she and her son escaped to Tijuana to move in with her sister-in-law. In a foreign environment with few connections, Camila did her best to provide for her son and was eager to start fresh. Her living situation was promising, at first, but violence soon erupted there too. Covered in bruises, Camila went to the Immigration Office to seek help, and they brought her to The Salvation Army’s Casa Puerta de Esperanza. “I came from a very bad life, but when I came [to Casa Puerta] I got a family,” she said. After two-and-a-half months living at Casa Puerta, Camila got a job at a swapmeet and was able to earn enough to rent her own apartment in Tijuana. Now—for the first time in a long time—she’s happy. “I’ve had my best story here, and have had a better life since I left,” she said. Camila is one of more than 2,000 women and children Casa Puerta has helped since opening in 2015. Casa Puerta de Esperanza, or “door of hope,” was designed to help the deportees repatriate to their community of origin or to build new lives in Tijuana. As the immigration issue has become more prominent, the shelter has been able to house women and children waiting for asylum in America or help them establish themselves in Tijuana. Hundreds of women and children come to Tijuana from all over the world every day, and have no family or connection in the area. They become targets for kidnapping and human trafficking. Most recently, people from Central America have been coming to the city in droves in hopes of seeking asylum in the U.S. The shelter accommodates about 21 women and children at a time, and is always at capacity. Families are allowed to stay up to three months. Employees work with the mothers to help them find housing and employment. Residents also receive counseling and health care. Casa Puerta was born in 2015 out of a partnership between The Salvation Army and entrepreneur Alex Zikakis. 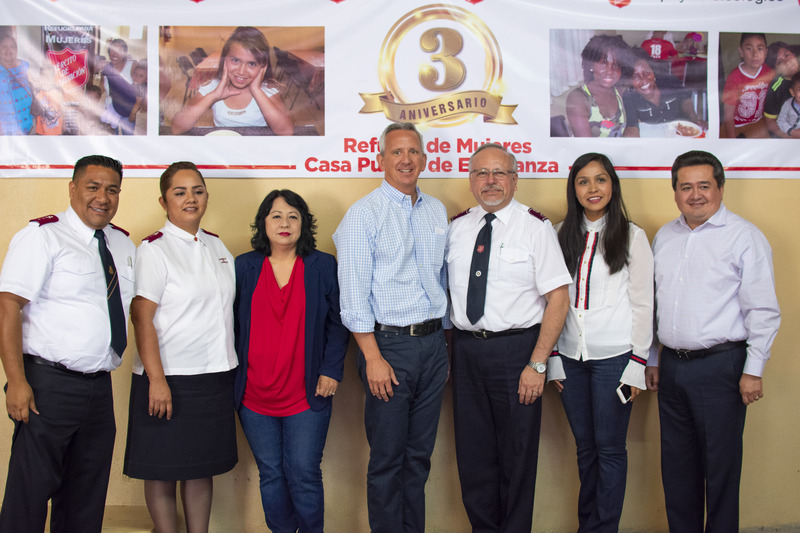 He realized the need for a safe place for women and children after visiting The Salvation Army Tijuana’s shelter for men recently deported from the U.S.
Zikakis, along with other organization who help the shelter thrive, was honored and thanked at the celebration for their work with Casa Puerta de Esperanza. “We couldn’t do what we do without their help,” said Captain Karina Olvera, Program Director of Casa Puerta de Esperanza. 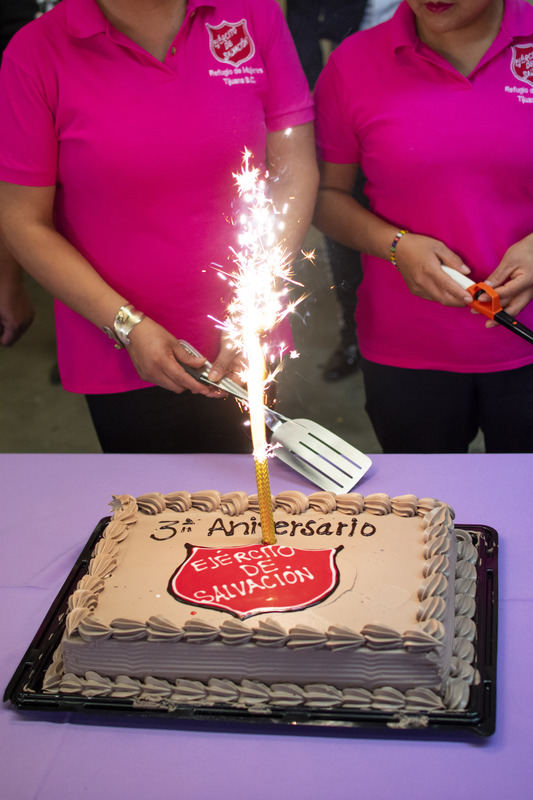 The event included words of appreciation from partnering organizations, remarks from Territorial Commander Oscar Sanchez, a testimonial from a graduated resident and even a mariachi band.